S’mores. Bars. Fail. | One Picture, A Million Words. There is a quote “ambition is the last refuge of failure” from Oscar Wilde that I can prove wrong by my attempt to make s’mores bars. Just look at that gooey mess: the proof is in the pudding. Tomorrow is my daughter’s birthday party (she is turning four!) and I thought making s’mores bars is a good idea because Lana loves marshmallows and chocolate so what better way to combine those two than in a much beloved, classic s’mores-type confection? Googling s’mores bars led me to many recipes and I settled on one that required marshmallow creme, a product which I could not find in every supermarket that I had been to. A wiser soul would have given up and switched recipes. But not me. My perseverance stands in the way of my wisdom sometimes. I decided that if I couldn’t buy marshmallow creme I would make it at home. Nothing is going to stop me. I bought a bag of marshmallows and followed another internet sourced recipe for homemade marshmallow creme by melting marshmallows and corn syrup together. I did this despite reading from other internet posts that this method will not work. Hey, I said nothing is going to stop me, right? And indeed, the internet gods were right. 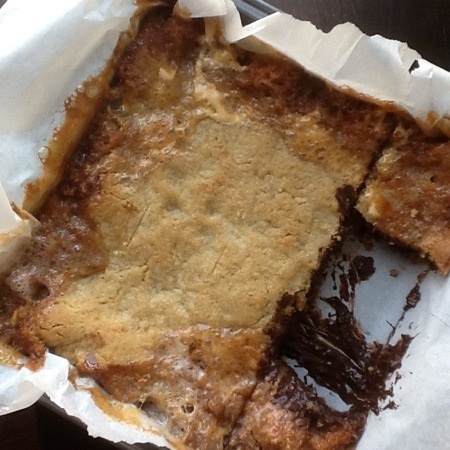 The melted marshmallows dissolved in the heat of the oven, fused with the chocolate into a sticky brown gloop and bubbled over the cookie crust. The result was ugly but proclaimed delicious by my long suffering husband (thank you, dear). Nothing brings me down like a baking failure. It is a waste of time, energy, money, good ingredients and most of all, a dash of all the hopes I had for these s’mores bars. The only good that came out of this failure is that I now know not to replace marshmallow creme with melted marshmallows. They are two wholly different creatures. In case you were wondering, I picked myself up from the ashes and made another s’mores-inspired confection that is now chilling in the fridge for tomorrow’s party. I melted marshmallows with corn syrup before too! But I was making rice krispies so it wasn’t as difficult as yours. Now i know the reason behind your stressed tweet. Hang in there!